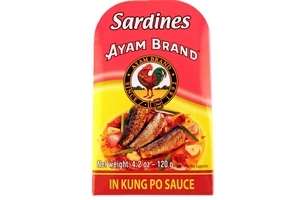 Ayam Brand Sardines in Kung Po Sauce in 4.2oz (120g) easy-open can. Ayam Brand Club Sardines Kung Po Sauce with Asian Recipe. Ayam Brand Sardines in Kung Po sauce contains fried sardines in a traditional oriental spicy Kung Po sauce mixed with spices, onions and ginger. It is a popular flavor for the Asian community. Ayam Brand Sardines is also one of the best natural sources of Omega 3 and calcium. Ready-To-Eat. Product of Malaysia. Halal Certified حلال . Ayam Brand Sardines come from the cold seas and hence are more fatty, juicier and richer in Omega 3 in order to withstand the extreme coldness. Sardine Oil may appear on the surface of the sauce in the form of white particles, depending on the storage temperature. It dissolves once heated. This occurrence is natural and it is a sign of quality.